Here are the basic facts demonstrating why the official story is impossible. More than ten years later, an enormous number of people have woken up to these facts. Most of the steel from the Twin Towers was found far outside the bases of the towers in straight pieces cut cleanly at the ends. Core beams and perimeter assemblies weighing up to twenty tons were hurled laterally for hundreds of yards at speeds of up to 80MPH. This is conclusive evidence of explosives demolition rather than gravitational collapse. Jet fuel is only kerosene. Spilled jet fuel burns no hotter or longer on an open surface than ordinary lighter fluid. The National institute of Standards and Technology (NIST) found no evidence of fires over 480F in tested steel samples. This is the temperature of normal office fires. High-rise furniture and upholstery is fire retardant by law. Most of this kerosene blew out in the fireballs on impact. 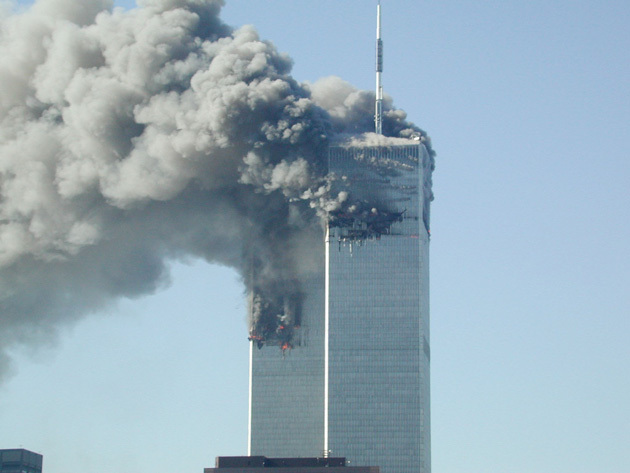 The tower which was hit last, and damaged the least, was the first to disappear. The plane which struck the South Tower came in at a diagonal and struck a corner of the building, just grazing the core columns. Almost all the kerosene was lost in the fireball. "I believe that the building probably could sustain multiple impacts of jetliners because this structure is like the mosquito netting on your screen door -- this intense grid -- and the jet plane is just a pencil puncturing that screen netting. It really does nothing to the screen netting." 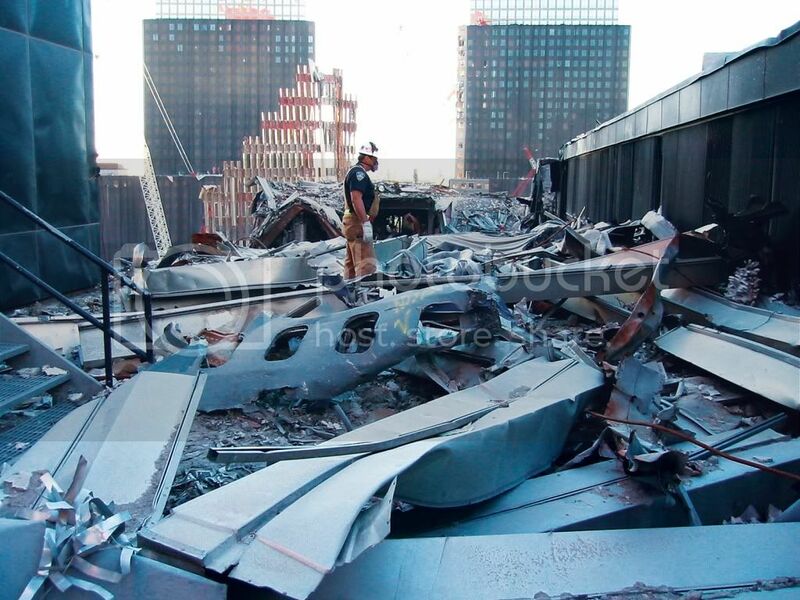 The jetliner impacts did no significant damage to the steel frames of the towers. Jetliners are essentially hollow aluminum tubes. A 767 is approximately 1/2500 of weight of one tower. The kinetic energy of the planes was absorbed by the much greater mass of the towers. Aluminum is only one-third of the density of steel. The photo below shows that the planes were shredded on impact. The fires resulting from the plane hits were small and isolated, not "raging infernos." Just 7 minutes before the collapse of the South Tower, Battalion Chief Oreo Palmer said in a radio transmission from the 78th floor: "Ladder 15, we've got two isolated pockets of fire. We should be able to knock it down with two lines." Two lines refers to two fire hoses. No high rise of any kind of construction has ever disappeared from the skyline within seconds as a result of fires, or indeed, as a result of anything but controlled demolition. In the case of the Windsor fire in Madrid in 2005, in a high-rise of weaker construction than the Towers, the fire burned for 20 hours throughout all floors. From a standpoint of chemistry and physics, the fuel required to generate the amount of heat-energy needed to raise the temperature of the structural steel to the point of failure was not present. 9/11: South Tower burned for 52 minutes before destruction. Black smoke is indicator of oxygen-starved fires going out. The amount of kinetic energy generated by the possible collapse of a few floors is not remotely enough to crush 90 stronger floors beneath that collapse. The difference in these energies is many orders of magnitude. If the official story is true, then it revolutionizes the steel foundry business. This industry spends lots of money on blast furnaces which burns lots of expensive coal or coke (refined coal) in an enclosed ceramic chamber. Pre-heated air is "blasted" through the fuel to raise steel to 5,000F to melt, and nearly that high to become malleable. There have been partial collapses in small sections of steel-framed high-rises, but complete and catastrophic failure in a matter of seconds is impossible except for in controlled demolitions. Falling mass does not accelerate as it accumulates. The official story relies on a purely imaginary "domino effect" whereby each collapsing floor adds to the overall weight, and drives a "chain reaction." But this ignores the enormous upward static force of the supporting steel columns, both in the core and in the perimeter, which is much greater than the initial kinetic energy downward. Accumulating mass could not drive the downward fall faster, because all objects fall through air at the same speed, per Galileo. Floors which collapse on one another do not go "faster and faster." They go slower as energy is absorbed. A 9/11 Story Problem: Which 15 story building hits the ground first? 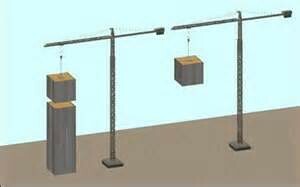 Answer: On 9/11 both upper blocks hit the ground at virtually the same time, suspending the laws of physics! - It is not available to do the work of "crushing" the building below! - It would have to slow down in order to do any other work, i.e., "crushing 80,000 tons of structural steel below. Then there is WTC7. No plane hit it which would have "weakened the structure" as the official story maintains for WTCs 1 and 2. There was heavier debris damage and larger fires in many adjoining Trade Center Complex buildings, yet WTC 7 alone fell down dead-level, at virtually free-fall speed, into a neat heap inside its own footprint. Houses of cards and of building blocks have no solid joints, and therefore offer no resistance as they fall. The towers and WTC 7 had enormous resistance to stresses and failure at all points in the structures, yet fell as if they were houses of cards. This illusion cannot be sustained upon even cursory examination. The upward static resistance of the vertical steel backbone running up the center of the towers could not have been overcome by a partial collapse of floors. 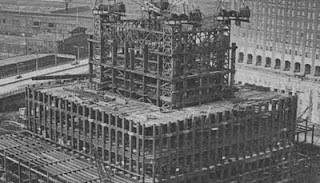 The towers' "backbone" of 47 steel beams, running continuously up the entire height of the towers, were heavily cross-braced and reinforced so that load would be redistributed in the event of the failure of any single member or members. This is in accordance with standard design principles. All modern skyscrapers have a built in "safety factor" of three to five, the ability to withstand three to five times the maximum possible stresses, under extreme conditions, in any direction. The Towers were most probably even stronger than this. At the base, the 47 core beams were nearly five feet wide. The "domino"-like collapse mechanism, sometimes described as a "pile driver" effect of collapsing floors, is impossible when one recalls that there was nothing actually on top of the 47 core columns, which ran continuously from the ground to the ceiling of the highest floor. Thinking of the core backbone as a record player spindle, the stacked vinyl records would represent the floors. Excessive downward stress on the floors would strip them from the core, like records falling down along the spindle. There was no compressive force directly atop the core columns. There is one scenario under which the countless inconsistencies, puzzles, and anomalies of 9/11 fall into place: that of standard demolition cutter and kicker charges, one of which "cuts" a beam a split second before another one "kicks" it out, as in the following demolition in China. The molten steel which flowed in the basements of the towers like a "Dante's Inferno" would be perfectly explained by the use of thermite, an incendiary which melts steel rather than cuts it, in a violent exothermic reaction which can reach 5,000F and could release enough heat-energy to raise the temperature of molten steel to a point which would keep it molten for weeks, even months. This is similar to the way in which a pot of water which is brought to near boiling stays hot much longer than one heated to just a few degrees above room temperature. Substances absorb heat, and the more that is absorbed, the longer it takes to cool off. The fact that high-grade thermitic compounds, which can only be made in a laboratory, were found, without triggering an investigation of the source, is almost inconceivable. None of this touches on the "who and why" of 9/11, since that is putting the cart before the horse. To ask the motive or motives behind a crime, before it has been established that the crime has been committed, is premature. In this case the crime is a false flag attack blamed on a terrorist network known as Al Qaeda. Suffice it to say that all wars have beneficiaries. Want Truth ? Here it is. The Greatest 9/11 Truth Link on the Internet. Even Building 7 in Song !